Cognitive experts report that students remember 5% of the content they hear. With lecture as the most common college instructional practice, we must find ways to amplify its impact. Engaging students throughout the lecture with brief, meaningful activities can help them better comprehend and apply what they have learned. Why do we lecture? Lecture gives the instructor control of the classroom and pace of learning, it can be cost effective and an efficient way to deliver content, it can summarize and review information, it is easy to revise and improve, and students are used to it and accept it. Active lectures have a limited scope, are short and chunked into topics, assess student’s prior knowledge, involve the student in the conversation and ask students to do things to reinforce and demonstrate their skills and understanding. Classroom Response Devices – Poll Everywhere, Kahoot, Quizlet, Quizizz or other technology-supported questions that students may respond to anonymously. Elaborating – Give students a topic or idea and ask students to write down everything they know about it in groups of 3. Ask students to explain processes, related concepts and topics and how the given topic relates to other course material. Group Research/Response – halfway through the lecture, pose a higher order question and have students pair up or work in a small group to research or develop a response. Keep-ers – Faculty include a slide in their presentation that highlights the most important points of the lecture that are worth “keeping”. Students are asked to explain why these are key. Minute Paper – Students take 1 minute to write down all of the important points they have learned so far in the lecture. Faculty collect the papers to see if students are on the right track or if there are concepts that should be reinforced. Muddiest Point – Students jot down the concept that is most confusing to them. Faculty collect the papers and respond through re-teaching, or posting answers on Canvas. Nominate a topic for further discussion – Students nominate a concept that is not clear to them and the majority affirm the concepts that are most important to review. Paraphrasing – Ask students to rewrite or rephrase processes, ideas, theories, or other important points in their own words as if they were going to explain it to a younger brother or sister. Post Cards – Give students an index card and have them draw a picture and write down takeaways from the lesson. Predictions – Following the reading of or listening to material, students predict the next action, reaction in the text or lesson and explain why. Quiz/Share/Repeat – Halfway through the lecture, students are given a non-graded set of quiz questions. They respond to the questions and share their responses with a partner for confirmation or clarification. The quiz is then repeated. Reflection/Connection - Students are asked to take a moment to reflect on what they have just learned and identify a connection to prior knowledge. Share Notes – Students take a moment to share notes with a partner to identify what they wrote down and why. Think/Pair/Share – Students reflect on a question; pair up with a partner/share their response. ​​This is the PowerPoint used to anchor the workshop on Active Lecture. ​Article with practical strategies on planning and executing an effective lecture. Designed to support new and existing faculty in organization and developing activities that support student engagement with content. Dr. Christine Harrington gives a workshop on dynamic lecturing. ​Light-hearted animated video that illustrates the challenge of using lectures as an instructional medium and offers tips to enhance your instruction. 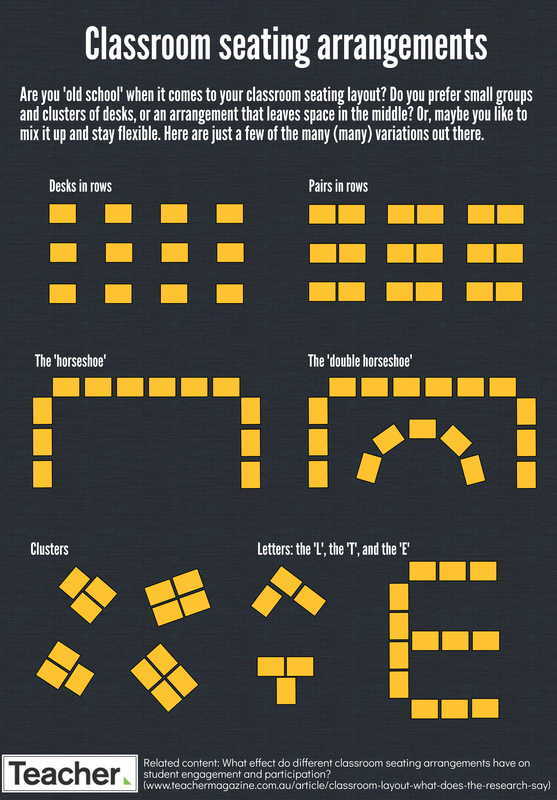 Ideas for organizing classroom seating.